The Beer Buz Mobile Bars serve Real Ales & Traditional Organic Ciders from across your desired county, beer chosen by you and sourced by us ! A choice of three different services to handle any size of venue,such as beer festivals, outdoor events, country shows, weddings, parties and corporate events, we can cater from 20 – 2500 people. Our flagship is our Theme Bar a VW Mobile Bar which is the ideal Mobile Wedding Bar ! Serving Real Cask Beer, Draft Chilled Lagers and Ciders and also specialist drinks, including Traditional Ciders and Organic Fruit Ciders and even Cocktails !! We also specialise in Hobson Beers, award winning ales brewed in Shropshire. All of which are supplied direct from the breweries and kept in our cellar so are Fresh and Cool on the day of your function. You can choose what ever you want to create the perfect bar environment. With over 10 years real ale experience, most recently running a Bridgnorth pub which was listed in the CAMRA Good Beer Guide 2011, 2012, 2013 and 2014, we know how to keep good beer…. No pre packaged bottles and cans as other mobile bars do this is the real thing direct to your door, we can also stock our bar with wine, spirits, and even crisps and nuts ! 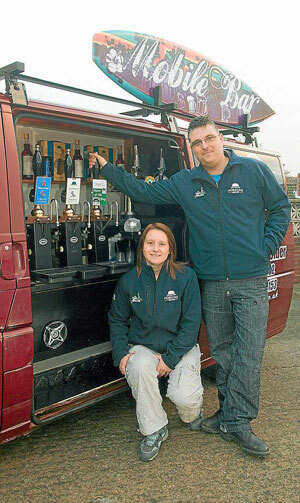 Beer Buz is a Shropshire Mobile Bar Service with a difference.